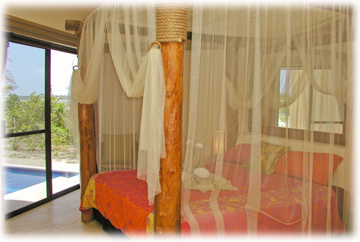 BR #6: Third level, swinging king bed plus single bed, private bath with tub and shower, ocean view. Rates are in US dollars per week based on 10 guests in 5 BRs, 12 guests in 6 BR, and 14 guests in 7 BRs. Nestled in Jade Beach, only one hour from Cancun International Airport, is this spectacular 5,000-sq. ft. Jade Beach Vacation Rental Villa. 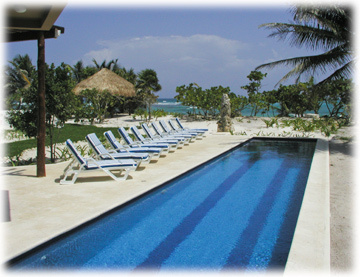 Casa del Sol Naciente, or House of the Rising Sun is just a short three-hour plane ride from New York and key Mid-West airports, you too can enjoy heavenly sunrises over the fabulous Caribbean from any one of five sumptuous bedrooms. Designed in the spirit of "Homes of the Yucatan" by leading Mexican Architect Enrique Alcaraz, Casa del Sol Naciente vacation villa is as evocative as the name suggests. The entrance to this private rental villa is graced with a unique fossilized limestone wall and the downstairs bathroom inlaid with river pebbles. Striking metal and stone ornaments reflect the vast usage of natural materials in the construction and decoration of this home. Directly to the right of the entrance is the downstairs bedroom, called the Poolside Room. Featuring a king size canopy bed, this bedroom would suit the swimming enthusiast! You can literally open the sliding glass doors and step into the 60-ft. lap pool (complete with waterfall and in-pool seating). Ocean view, private bathroom, air conditioning and a television make this suite complete. To the left of the entrance is the kitchen; an enormous space that would please even the fussiest of chefs! Twin sinks, modern appliances, and a walk-in pantry means it may be hard for some NOT to cook! The black lava granite breakfast bar offers a beautiful view of the Caribbean and features stools on both sides. The living room has two sofas and side chairs plus satellite TV and ever-beautiful Caribbean view. If you ever tire from gazing at the ocean, you can curl up and enjoy a movie on either DVD or satellite TV. You also have access to the lap pool from this room. The dining room is furnished with a magnificent Balinese hardwood table, with seating for twelve. Feel like dining outside? 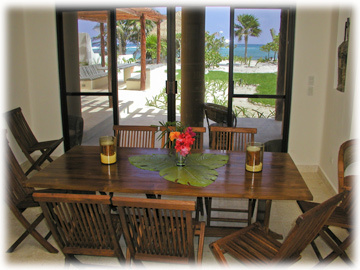 Casa del Sol Naciente boasts a magnificent outdoor dining table. 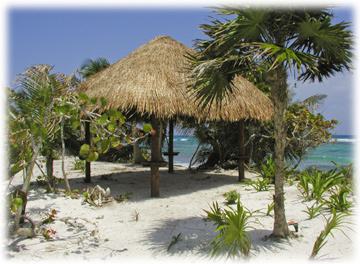 Constructed from polished concrete and covered with a hand-crafted palapa, this area comfortably seats twelve. A private walkway from the kitchen to your outdoor grill makes serving as enjoyable as eating. Mexican tile floors and hardwood steps lead to the five upstairs bedroom suites. First bedroom on the second floor, the Sunset Suite has a private bathroom featuring an exquisitely marbled and irresistibly deep bathtub. From the king sized canopy bed or private balcony, you will enjoy ocean views. Second bedroom on the second floor is the Sunrise Suite, also boasting a king sized bed framed in a brick arch and a wall inlaid with pebbles. This suite has a superb view of the sparkling Caribbean plus two balconies. A security safe is located in this bedroom. A marble lined tub also showcases this full bathroom. Step onto the semicircular, palapa-covered balcony to enjoy unparalleled views of Jade Bay. To the left of the spacious main hallway lie the Playa Suite and the Moonrise Bedroom. The Playa Suite shares the same semicircular balcony as the Sunrise Room. 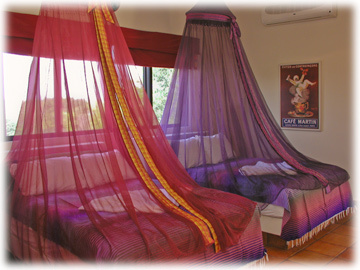 Here you will find a king sized bed and a mirrored wall that reflects the colors of the Caribbean. A second security safe is located in this bedroom. The Playa Suite and Moonrise Bedroom share a bathroom but for convenience, the owners have installed stone sinks in both suites. The Moonrise Bedroom is outfitted with a king bed. This room has its own balcony with sea view. The wild at heart will delight in wide, sweeping views of the incredible sea. 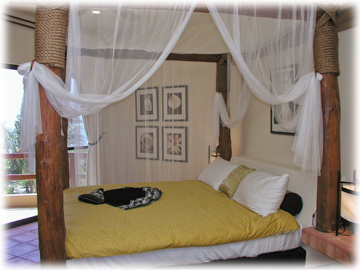 A sixth bedroom on the third level has a king bed plus single bed and panoramic views of the Caribbean. 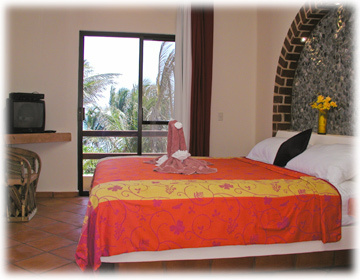 The seventh bedroom is a lovely courtyard casita with king bed, double bed and private bath. Unique to this home is that each of the six bedrooms in the main house feature a view of the gorgeous Caribbean. And, the swimming pool is a generous 60-feet long by 14-feet wide. 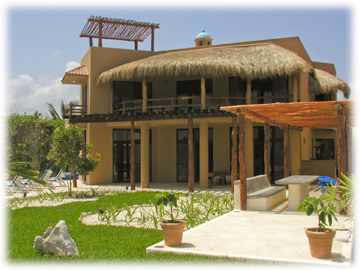 The roof top of this Jade Beach vacation rental villa is fitted with a palapa and double day bed. By day, soak in the spectacular 360 degree panoramic view of the jungle and water. At day's end, take in a spectacular sunset and view by night awesome sight of millions of glistening stars. A perfect place to end the day with your favorite cocktail! Should you wish to spend the day right at the Caribbean water's edge, a large (80 square foot) palapa along the beach has four individual hammocks and evening lighting where you can easily get "lost by the ocean". 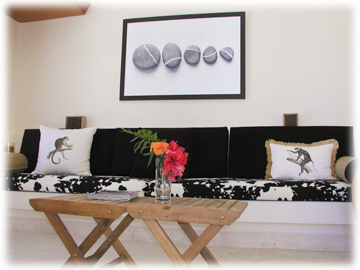 Casa del Sol Naciente's owner, who has worked extensively in fashion and design industry, has created an ambience that is both daring and elegant. The bedrooms are decorated with fabrics from the South of France and Frette linens grace the beds. Her choice of colors for the bedrooms reflects not only the vibrant and warm colors of the rising sun, but her own fun and colorful personality. Above all, she has created a home to share and enjoy! 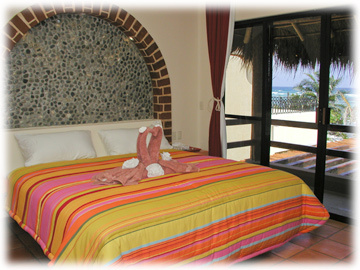 Caretakers live onsite in the separate casita at the entrance to the Casa del Sol Naciente vacation rental villa..